Let's just get this out of the way up front -- I am not a huge fan of what I call "teencentric" novels so I didn't love this book. However, to be very fair, it turns out when all is said and done to be quite suspenseful, atmospheric and incredibly sad all at the same time. Aside from the elements of mystery and suspense, it also reflects the emotional devastation of a family suffering from a terrible loss and what they do to cope. There is much truth in the statement "No good news ever calls after midnight," and in this case, the news is beyond bad. It seems that Elizabeth Sanderson's son Tommy, age 13, has gone missing. He'd been staying overnight at the home of Josh Griffin, one of his two best friends, but now he's simply vanished into the woods of Borderland, a park whose edges are very close to Josh's home. Along with their friend Luis, they'd taken their bikes to the park a number of times, hanging out at Split Rock aka Devil's Rock, doing typical boy stuff -- joking around, fantasizing about zombies, talking about the Minecraft world they'd created, etc. -- just regular things that signal nothing out of the ordinary for these kids. A search is launched based on what Josh and Luis (the third member of this trio of friends) reveal about that night, but as time moves on the case drags with no results. Elizabeth, of course, is devastated, along with her young daughter Kate and her mother, riddled with guilt and missing Tommy enough to where she begins to actually imagine his presence in their home. At this juncture, this would seem to be an ordinary story of a child's disappearance, but then the author does something very cool here, introducing some really weird, questionable things that start to happen, ratcheting up the tension bit by bit. Taken together, these events begin to call into question not only the other boys' version of events of the night of Tommy's disappearance at Devil's Rock, but to Elizabeth's surprise, they also reveal something about Tommy's state of mind about the earlier loss of his father. That's all I'm willing to divulge because what happens until we get to the truth of things is so bizarre and so strange that telling would certainly wreck things. 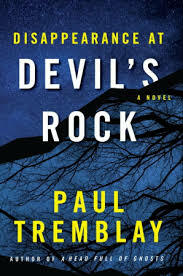 Disappearance at Devil's Rock will definitely be one to throw in a beach bag -- a good summer read. It's a slow burner of a story where the action sort of happens in waves. In between the events that take place at Elizabeth's house, in between Elizabeth's grieving and trying to hold things together for her family, we are made privy via flashbacks to little bits and pieces of the days leading up to Tommy's disappearance. This is a good move, and I like this sort of piecemeal approach to the truth, because really, it tends to raise a lot of questions in my mind. Including the bit about the Fox News commentators (and social media) was also a good move, because as everyone knows, ignorant people pointing fingers instead of offering anything in the way of sympathy or help is what news media and internet trolls are good at, and sadly they are a part of everyday life these days. Really, there are a number of good moments here, but then there are also places where I had issues. For example, sometimes the boys' conversations got old and repetitive to the point of sheer boredom. I was so sick of the word "hardo" after a while -- I get that the author is writing teen boys here, but less would have been so much more. I also didn't care for the way he wrote Kate -- the spunky little sister bit didn't quite work for me. And, after certain revelations about the strange occurrences in the family home, the story sort of dragged along until the last part of the novel when boom - things pick up in a big hurry at which point everything pops to end in a good and satisfying way. So the bottom line is that I have mixed feelings about this one. I'm probably the fish swimming upstream again because this novel is getting uber-rave reviews. I'll just say that while I found it a bit flawed writingwise and too much on the edge of becoming a YA novel for my taste, at its core there is a good, suspenseful and tragic mystery here. My many thanks to Trish at TLC Book Tours for the opportunity to read this book. The use of flashbacks to create tension and introduce the tragedy sounds like a great way to keep readers on edge. This book sounds sensational, and a definite 'I wanna read.' Wow, great review: mystery, suspense, family tragedy; it sounds so very intricate and fast reading.